This question popped up recently in the Acrobat community. I have a single page form posted online for people to fill in. It is a monthly budget. They select the month that they are reporting for then fill in the blanks. I often get multiple months/forms emailed to me from an individual at one time which I want to combine into a single pdf document. When I try to combine the files Acrobat generates an error message saying that I cannot combine the forms because the field names are the same, and that I have to use a “portfolio” otherwise is will give all the fields with the same name the same value. Is there an easy way to combine these forms and keep the unique value in each field on each form?? Thank you for your HELP! When you use the same form field name within your form, it can be a great timesaving feature for recipients. It means they only need to fill in the form field once and any other form fields with the same name will be filled in automatically. Sounds great, until you need to compile all your forms into one file for archiving. So, here are a couple of suggestions to address this workflow – note the second suggestion doesn’t work on PDF forms created using LiveCycle Designer. The first workaround is to combine the forms into a Portfolio instead of a single PDF file. This will eliminate the issues with data in the individual form fields and is quite easy to do. 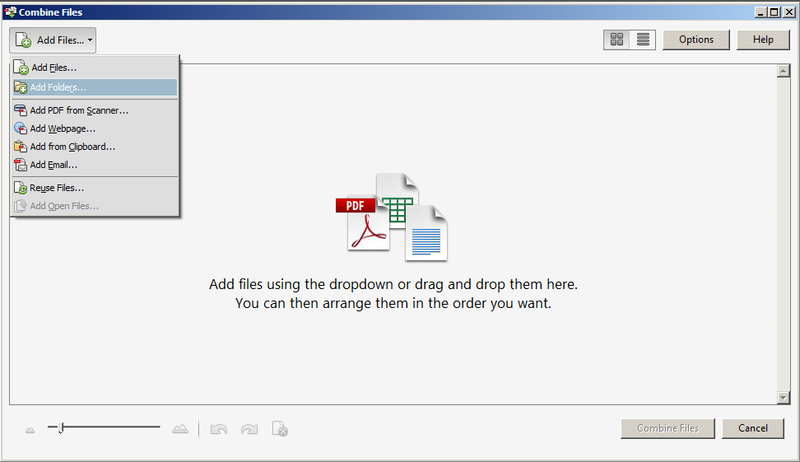 Just select Combine Files into PDF from the Welcome Screen and add your files – you can even grab folders of completed forms. 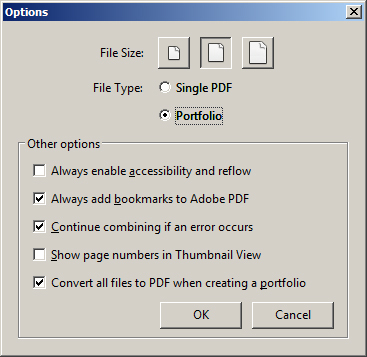 Under the Options button, be sure Portfolio is selected as the File Type, click OK, and select Combine Files. Now, Portfolios are nice but they can be a bit clumsy if all you want to do is page through a bunch of returned forms. The other workaround is to flatten the form fields, so the data doesn’t get all messed up, and then merge into a single file. This done by using the PDF Optimizer that’s part of the Pro. version of Acrobat. 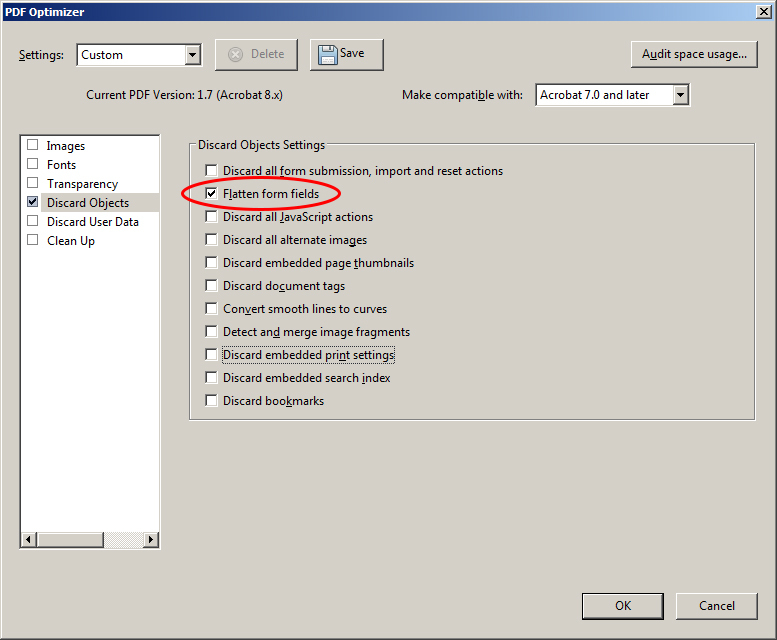 The PDF Optimizer is located under File > Save As Other > Optimized PDF (version XI). In Acrobat X Pro., it’s located under File > Save As > Optimized PDF. Select Discard Objects in the left-hand column, check “Flatten form fields”, and click OK. This will flatten all the form fields in the PDF file so they can no longer be filled out and allow you to combine into a single file. Again, combining can easily be accomplished using the Combine Files dialog. If you have several forms that you need to flatten, you can create an Action (with the Pro. version) to do this. Thank you for your post – I am trying to maintain fill-able pdf. forms once they are combined. Therefore, flattening the form fields will not work for what I need. Is there anyway to combine the forms without merging the form fields or losing the fill in option on the application? If you cannot flatten the form, then you’ll need to rename each form field before merging – no trivial task. Or, you could create a Portfolio of the forms or simply add them as attachments in the file. Hi there. Thank you for the post. It is very useful. I apologize for the noob question, but what is the software you use above to create the portfolio? The Pro. version of Acrobat has the Portfolio feature.